As a self-confessed vintage addict (also craft beer and ice cream addict) I love a good charity shop. In fact I prefer to shop in charity shops over normal shops because you can find some vintage treasures in charity shops. My 1920s Chanel and Lanvin dresses and 1920’s opera coat have come from charity shops. Also my Madeleine Vionnet and Dior dresses and accessories. Who says charity shops are horrible when you find vintage designer clothing in them?! As much as I love finding a designer or just a plain everyday vintage outfit in a charity shop (fun fact: I literally cried with joy when I found a 1920s vintage Chanel dress in a charity shop in Belfast!) 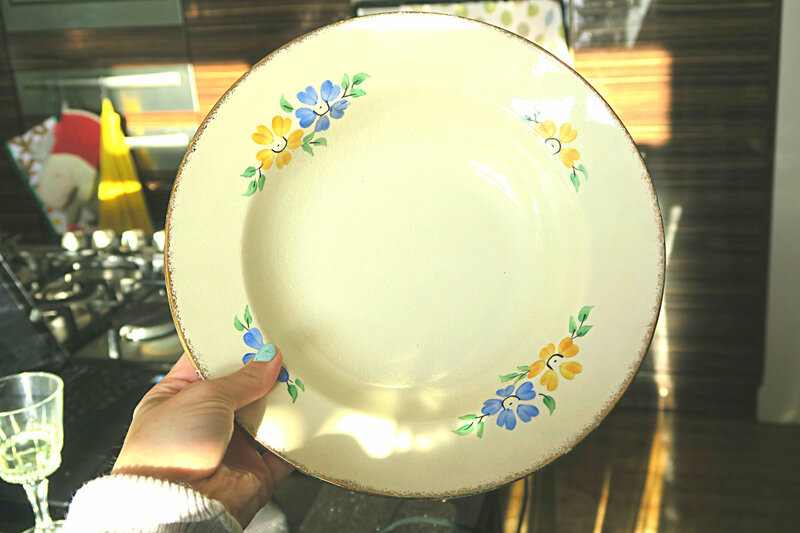 I also adore finding vintage homeware. 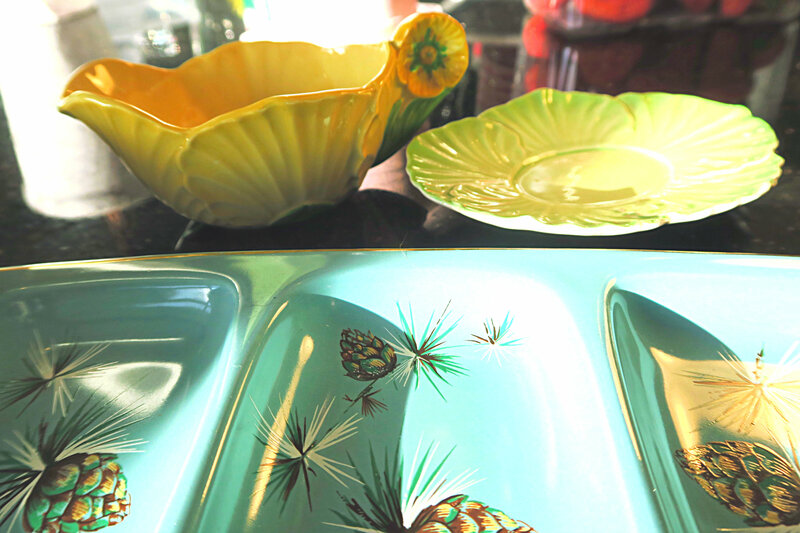 Especially tacky 1950s homeware in a range of pastel shades, atomic or tiki patterns! 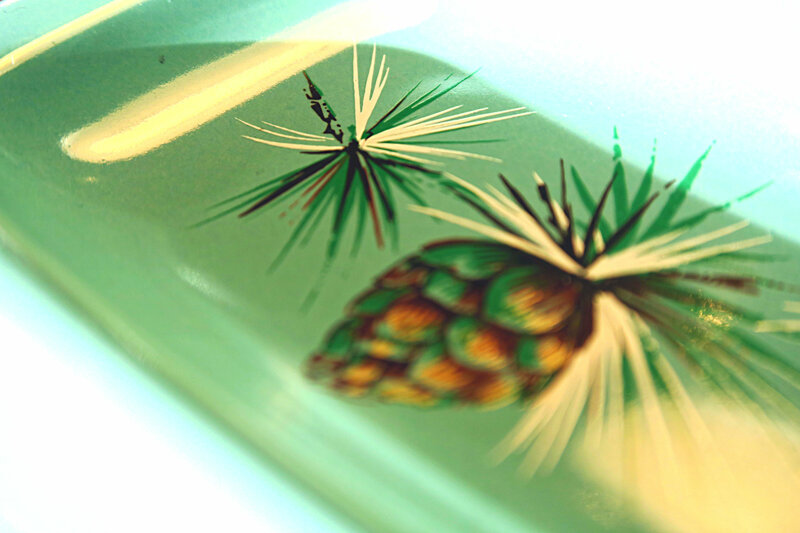 I also love finding art deco homeware specifically china, teapots and glassware! Today I decided to hit up the charity shops near me to suss out what they had to offer in terms of vintage clothing and homeware. Vintage clothing was hard to come by in the shops (which is not suprising as Vintage is very popular!) 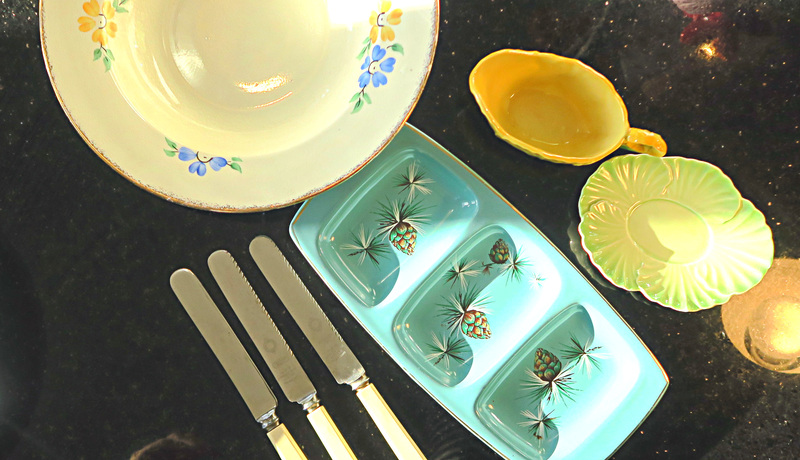 but on the vintage homeware point the offerings were strong! 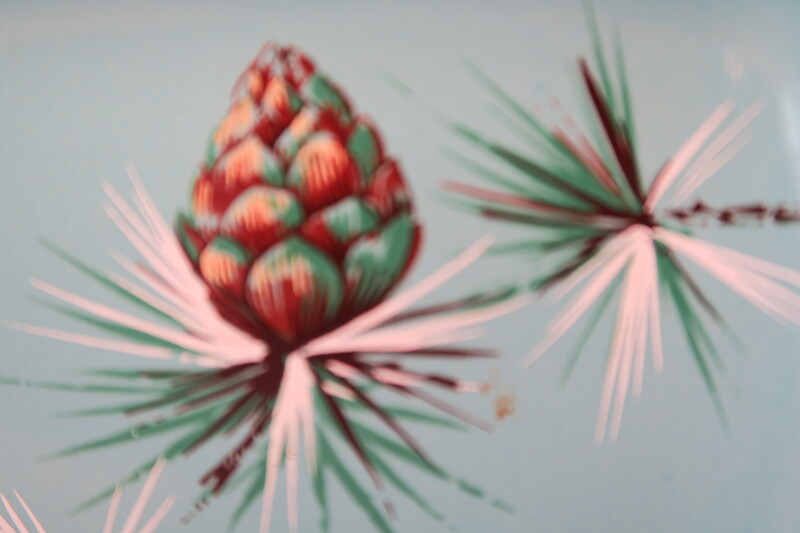 I got this fabulous turquoise pineapple print 1950s side dish which is perfect for a 1950s dinner party. This type of turquoise is very 1950s and is one colour I want to have in my future 1950s home albeit in a brigther shade of turquoise. 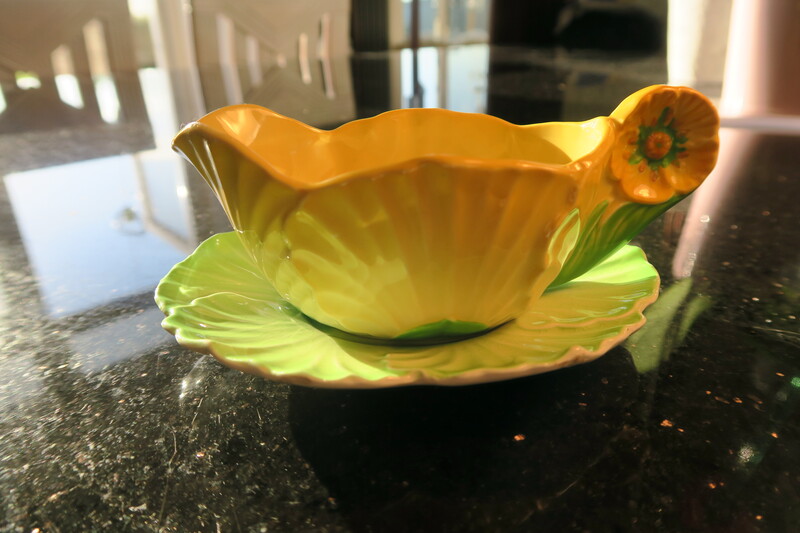 Next I found these 1940s or 1950s soup bowls or dessert dishes for two pounds! They’re deep enough for soup but also big enough for a generous helping of apple pie and ice cream! I also found this unusual small gravy (?) 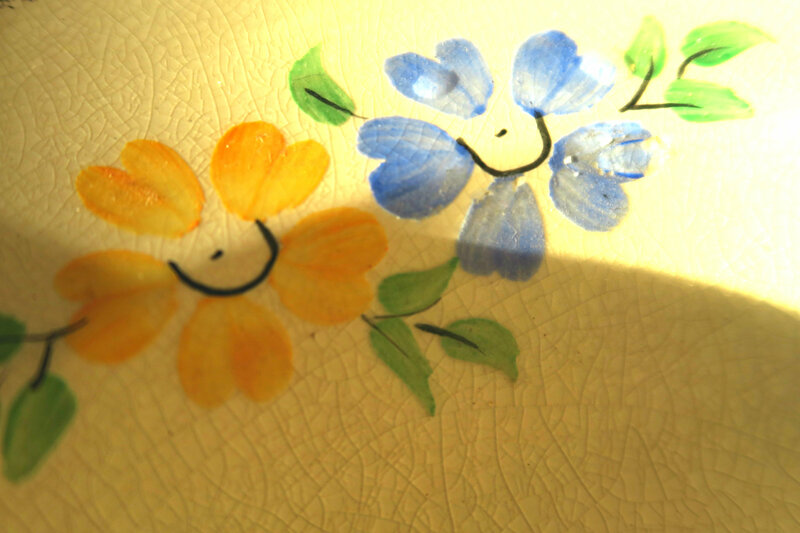 or sauce jug with a lettuce design on the base and a yellow floral design on the gravy/sauce jug. 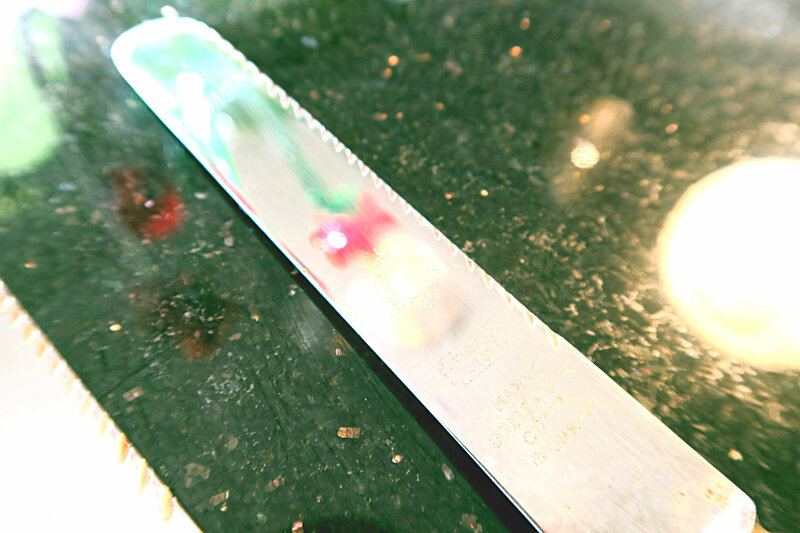 But my favorite thing that I found were these three Sheffield Steel knives. I love Sheffield steel and I have a full set of forks, dessert forks and spoons, tea and soup spoons but hardly any knives. These will be perfect for my collection! So there you go you can find some amazing finds in a charity shop! Dont’ let charity shops put yout off finding a vintage gem as I’ve said above my best vintage comes from charity shops! Next Post Get Ready With Me – Vintage Make-Up!